New Policy In LA Cracks Down On Problem Of Police Shooting At Moving Cars Los Angeles County sheriff deputies shot unarmed people in cars at least eight times between 2010 and 2014 because they said they feared being run over, an investigation by member station KPCC found. 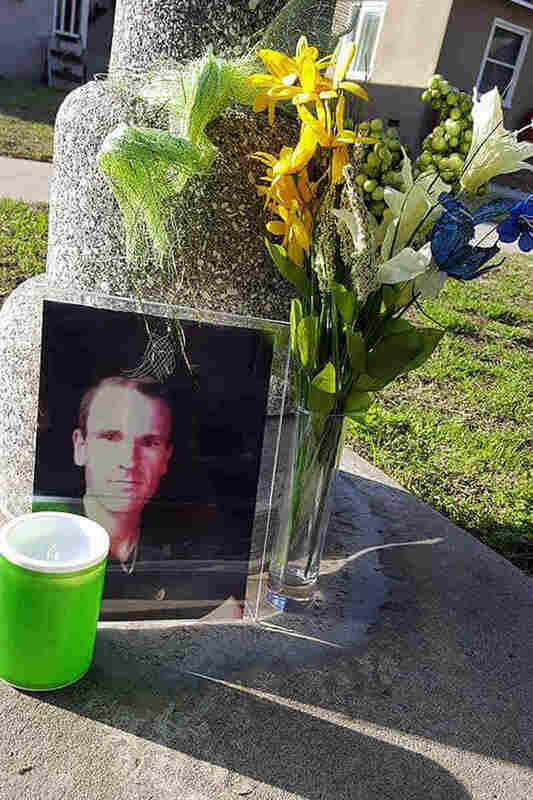 A memorial for John Berry, who was shot and killed by Los Angeles sheriff's deputies in 2015. "I've known my brother long enough he didn't mean to hurt anybody," said his brother Chris Berry. "He was terrified." Heavy scrutiny surrounding officer-involved shootings has some law enforcement leaders rethinking firing at moving cars. One of those agencies is the Los Angeles County Sheriff's Department, which recently changed its policy on the issue. The LASD is the largest sheriff's dept in the country, with about 10,000 full-time sworn personnel. NPR member station KPCC in Pasadena has been tracking the use of force by sheriff's deputies as part of an ongoing investigative series called Officer Involved. It found almost every driver or passenger shot by deputies was unarmed. John Berry was one of these unarmed drivers. Last summer, Berry sat in his BMW on his home street in Lakewood — a city south of Los Angeles — as sheriff's patrol cars blocked him from driving away. Seven deputies swarmed the vehicle, as a neighbor recorded the scene on her smart phone, and people called out to "Johnny," urging him to exit the car. John, a 31-year-old restaurant manager, was in the middle of a schizophrenic episode. His brother Chris Berry says John wasn't armed and wasn't dangerous. In fact, Chris called deputies for help, perhaps in getting his brother to a psychiatric hospital. So Chris was shocked when officers pulled out a baton, then Taser. "They were way too aggressive for someone who doesn't understand what's going on," Chris Berry says. Suddenly, John's car lurched forward, then back. The deputies declined to comment for this story, but told homicide investigators they were scared they'd be run over. That's why they shot. Chris Berry says there was no reason to shoot and kill John. His brother suffered from a severe mental illness. "I've known my brother long enough he didn't mean to hurt anybody. He was terrified," Chris says. Shoot Or Get Out Of The Way? John Berry's case raises many issues. Among them is a tactical one that isn't discussed often: Should officers shoot a person if they're afraid of being run over? Or should they just get out of the way? The Los Angeles Police Department, which serves the city of Los Angeles, has cracked down on the practice and virtually eliminated shooting at moving cars with unarmed occupants from 2010 through 2014, KPCC found. 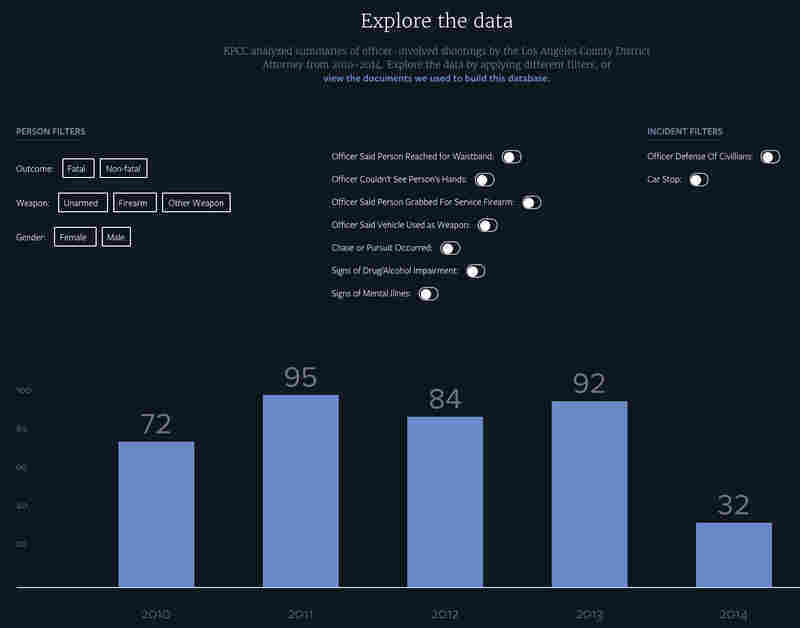 KPCC analyzed summaries of officer-involved shootings by the Los Angeles County District Attorney from 2010-2014. Explore the full series. But the KPCC investigation found Los Angeles County sheriff deputies shot an unarmed passenger or driver in a car at least eight times during the same five-year period because they said they feared being run over. In most cases, shooting at a moving vehicle doesn't make a lot of sense, says Todd Rogers, an assistant L.A. sheriff. Rogers says the shootings in KPCC's investigation are justified. But he also agrees with a growing number of law enforcement leaders who say injuring someone behind the wheel can make the situation more dangerous. "Chances are you are not going to kill the vehicle. You are not going to stop the vehicle. It is still going to be moving forward and everything in its path is going to get hit," he says. If the driver — the target — is hit, that means an unmanned 3,000-pound vehicle is suddenly tearing down the streets of Los Angeles County. Add to that the issue of bystanders. In May 2005, L.A. sheriff's deputies unloaded 120 rounds on an unarmed man in a Chevy Tahoe in Compton. Bullets reportedly sprayed five neighborhood homes. One bullet was found two blocks away, lodged into the wall of an elementary school. A month later, the L.A. Sheriff's Department wrote a new policy discouraging firing at moving vehicles. But the shootings continued. "We are probably shooting at moving vehicles too much, because it is not an effective tactic, not because deputies aren't legally justified in doing so," Rogers says. Legally justified, Rogers says, because deputies are allowed to shoot when they fear for their life. In two cases KPCC examined, deputies said the driver reached for a gun. But in all other cases, the weapon was the car itself. In those two cases and the eight in which no gun was found, there were a total of four fatal shootings. Sean Van Leeuwen is vice president of the Association for Los Angeles Deputy Sheriffs, the deputies' union. He says the solution is training. In fact, it's Van Leeuween's job as field training officer to teach deputies how to handle threats. And the sheriff's department changed its policy, following KPCC's original investigation. It released a training video that teaches deputies that shooting at cars in dangerous. And it updated its policy, effective this month, which explicitly states: "Firearms shall not be discharged at a stationary or moving vehicle, the occupants of a vehicle, or the tires of a vehicle unless a person in the vehicle is imminently threatening the Department member or another person present with deadly force by means other than the moving vehicle." In other words, unless another weapon is present, stop shooting into cars. As for consequences, the sheriff's department will review deviations from this policy on a case-by-case basis. Aaron Mendelson contributed to this report.